The older I get, the more I want matching soft and cozy PJs. 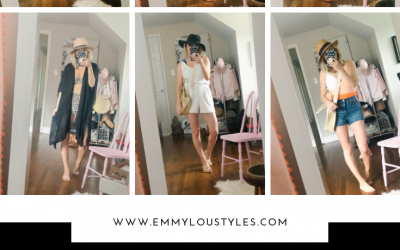 And with the holidays upon us, I thought it was only appropriate to do a round up of some cute and cozy pajama gift ideas to include on your wish list OR to buy for others. You can always count on Old Navy to have bright and fun / festive Christmas Jammies. I snagged these for myself for the holiday season. Old Navy Thermal Sleep Sets // Under $20 for the set right now! I love Target’s Gilligan O’malley brand PJ’s. They are soft and hold up pretty well for the price. So last Christmas the hubs + kids got me the SOFTEST PJ’s that I own. The brand is Shimera (purchased from Nordstrom Rack) and seriously they are the softest thing I own. I don’t have this set shown below, but I promise you they are soft. Another fave of mine are the Make+Model fleece joggers at Nordstrom. These are SO comfy. Several colors on sale now! 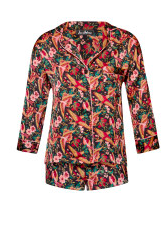 And last but not least, did you know that Sam Edelman also carries amazing pajamas besides shoes?? Well, it’s true! I own this cute bird print but there are a few other options on sale right now too. These would be under $30! Loving these pajama gift ideas? Click here now for more awesome gift ideas! 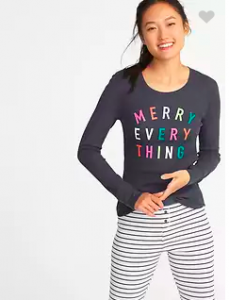 I really like the merry everything pjs!! They are so cute and could be perfect whether you celebrate Christmas or another holiday. I love getting pajamas for Christmas!! Such a fun indulgence that I dont usually purchase for myself. I think I might start this new tradition for myself! They look so comphy. Love the set from Target. Super cute ideas! I love soft & matching jammies! Those joggers look so incredibly comfortable!! I love cozy pajamas! That Merry Everything top is so fun for Christmas! Christmas PJ’s are the best and I am loving these! So cute! This sounds amazing! I need to find this nightgown!